He is a Spanish architect and he gained his Diploma in 1969 at the Technical School of Architecture of Barcelona, he is a professor of construction in the same school. In 1983 he joined the designer and architect Lluis Clotet, to establish his own studio. 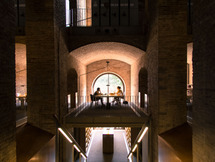 Since then the collaboration of these two architects has led them to erect buildings full of creativity and imagination and have been awarded several prizes. Among its buildings stand out, a housing building in the Olympic Village (1992) and Illa de la Llum (2005). According to his own words, modern architecture has opted for eternal youth, the smoothness of a skin without spots or wrinkles seems to be the goal of contemporary imagery, but time paints with the brush of rain and the color of dirt. Its buildings outline are the reflection on the possibility, chronologically and meteorologically, of foreseeing the imprint of time.